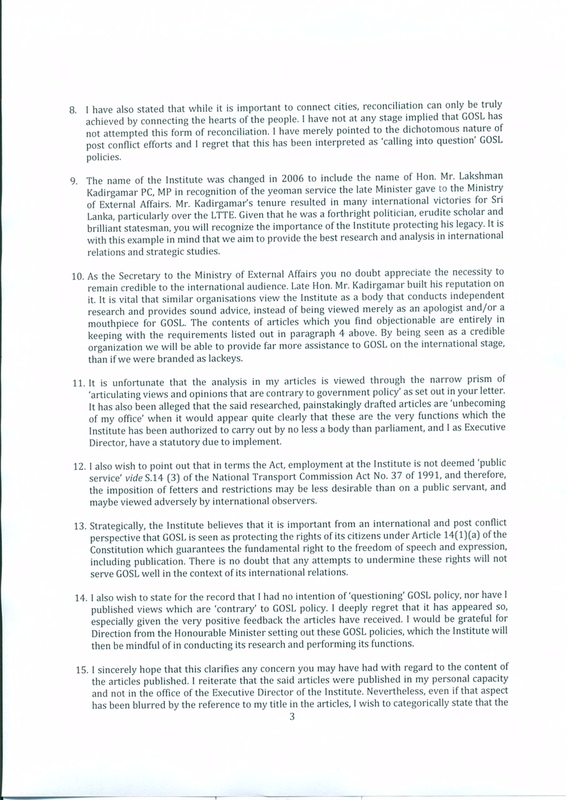 In a rather strange development at the Ministry of External Affairs for the appointment of Kshenuka Seneviratne as Ambassador to Thailand who has questioned this author (see the following letter)and presented much trouble as Secretary to the Ministry of External Affairs, when independent writing was produced against or advising Mahinda Rajapaksa over his term as President. She was the closest to Sajin Vaas Gunawardena and did everything possible to destroy our foreign relations image. At the Parliament debate according to Sajith Premadasa who clearly stated it was Sajin Vaas Gunawardena who was the inventor of slap diplomacy, a new art something similar to hard and soft diplomacy. When speaking regarding this matter with Anura Kumara Dissanayaka the JVP leader he said “now the punishment transfer is Thailand”. 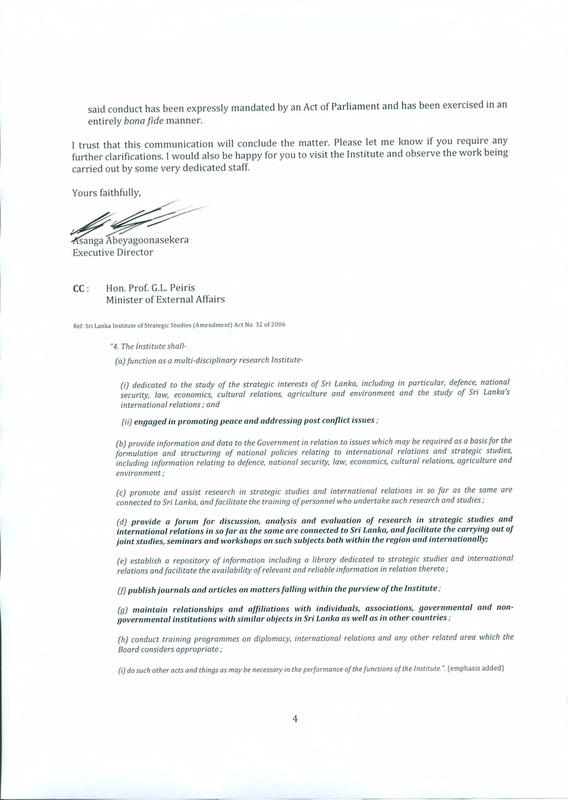 The following letter was issued by Kshenuka requesting me to stop writing against Mahinda Rajapaksa regime. 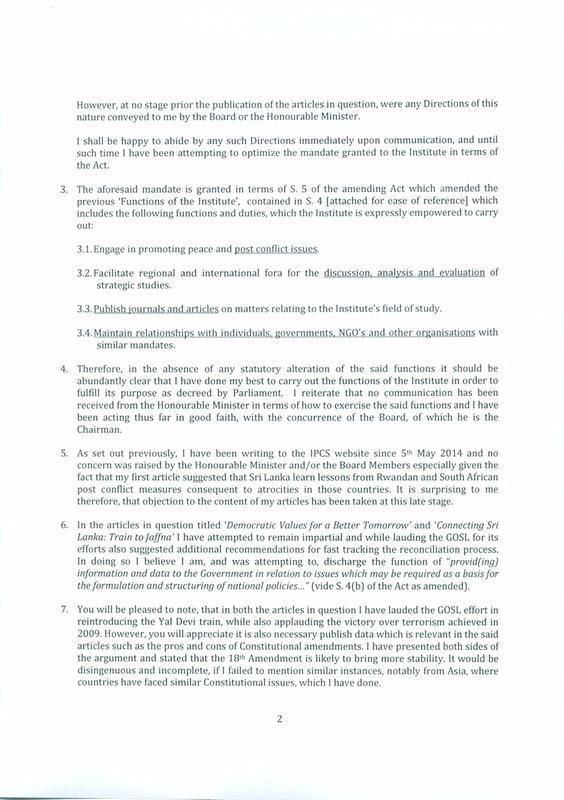 If you read the two essays I have written clearly to advise Mahinda Rajapaksa to do the right thing not to take him out of power. It was a team of close ill advisors who got Mahinda Rajapaksa out including Kshenuka. She put an end to our reconciliation conferences at Kadirgamar Institute blocking all our funds basically asking us not to do anything. When foreign secretaries such as Romesh Jayasinghe and Amunugama assisted to develop the Lakshman Kadirgamar Institute an important area for the Ministry what she did was the reverse. All research staff who has been kicked out by Minister Mangala Samaraweera from January, wonder what they are doing at the institute without any staff. In our neighbour India, while political appointees may be asked to leave when a new Minister is appointed, competent junior staff who are necessary for the continuation of work are retained to keep the wheels of State turning even at transition. When this author complained regarding this to a strong UNP political leader he said go to Minister of Good Governance and complain. Now six months have gone and most of the researchers are working at other think tanks and has no interest to join government think tank again due to this. We raised the statue of this great man Lakshman Kadirgamar which was dumped for many years at the Institute car park to show that such incredible men of great value who sacrificed their life deserve a better place. The lady who accused and called the audit against Kshenuka is now accused of being close to the LTTE, a strange development. On a visit to Cuba by this author to present one of the initial research papers by a Sri Lankan think tank to the Cuban think tank, was pleased to hear the integrity and the hard work she did at the Cuban embassy in Sri Lanka by many Cubans who praised as a brilliant ambassador which I was proud, for having such efficient officers such as Tamara Kunanayakam in our Government service. It is a known factor that it was Kshenuka who got brilliant people like Dayan Jayathilaka, Tamara and Rajiva Wijesinghe out of the Ministry. One of the grave mistakes done by Rajapaksa was to appoint Kshenuka instead of bringing Ambassador Prasad Kariyawasam at that time. One should raise the question who advised to hire Bell Pottinger and foreign consultancy firms to pay millions of dollars? This was the questions raised by the UNP at the last presidential election. Minister GL Peiris a person with highest integrity couldn’t do much with this setup.- CC given to Hon GL Peiris !!! 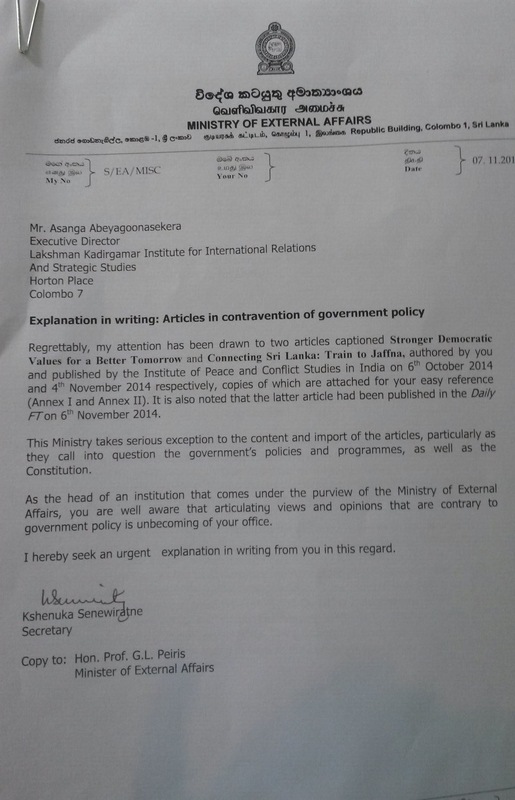 if it is not (CC) than Hon GL Peris used his legal right against Kshenuka Seneviratne . 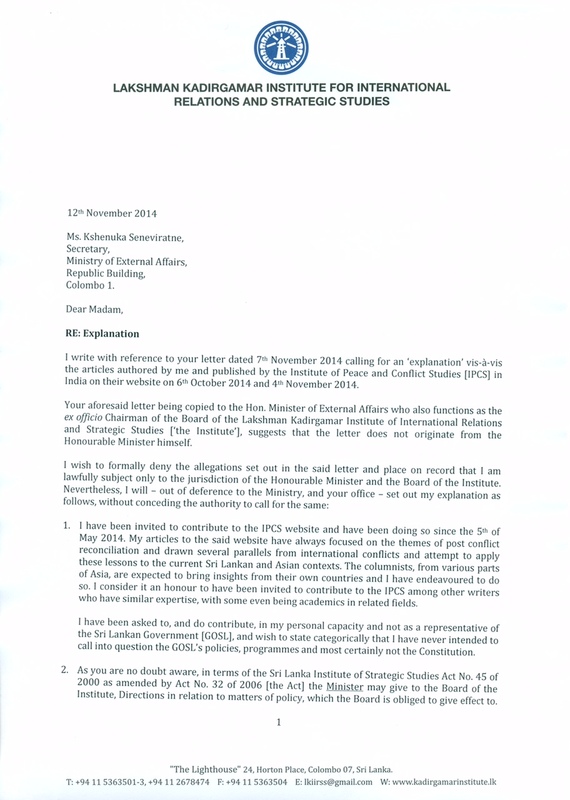 If it is CC than Hon Gl Peris is responsible for this letter as his Office . This entry was posted on Friday, June 26th, 2015. You can follow any responses to this entry through the RSS 2.0 feed. You can skip to the end and leave a response.